The industry benchmark for compact tow tractors has once again raised the bar. 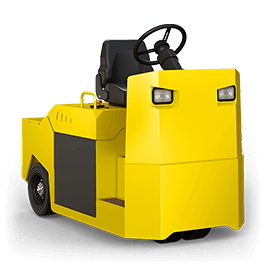 Still a quiet and low-maintenance workhorse with an unbeatable turning radius and up to 20,000-lb. towing capacity, but now with leaf spring suspension and shock absorbers, flat-free solid softy tires, inching control, protected electrical components and much more – all standard. Power and performance are delivered through a brushless AC powertrain with efficient direct-drive differential, hefty 1″ rear-end plate and large drum brakes. We’ve also got your back with a long list of standard ergonomic and safety features.